Raina is an average size Elfess, her soft fair skin seems to contrast her dark brown eyes and hair that frames her face. she stands 6 foot tall and seems very shy to the ones she first meets often talking softly to them as though she is unsure as to say or do. 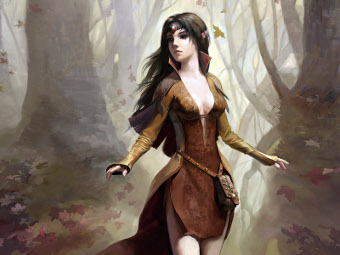 Raina Narethil hails from the Ancient woods of Kyr her home nestled deep inside hidden to all but her tribe, she grew up living a very sheltered life mainly her friends were the books she loved to read. Her past can be learned but only her friends will find out. since her shy nature keeps her reserved. Her story begins as she arrives on Gobiath where it goes for now only she knows and the gods above.